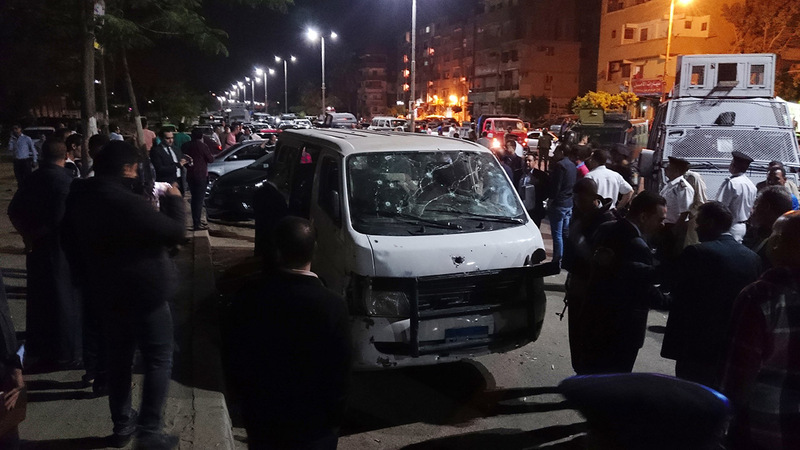 CAIRO -- Gunmen opened fire on a microbus filled with plainclothes police in a Cairo suburb early Sunday, killing eight of them, including an officer, in an attack claimed by a local Islamic State affiliate. The attack was the deadliest in the heavily policed capital since November, when gunmen attacked a security checkpoint, killing four policemen. That attack was also claimed by the IS branch. Egypt's state-run MENA news agency said the policemen were inspecting security in the south Cairo suburb of Helwan early Sunday when four gunmen in a pickup opened fire on them. Interior Minister Magdy Abdel-Ghaffar, in charge of police, ordered an investigation into the attack, calling the eight "heroes of the police martyrs who sacrificed their lives to preserve the security of the homeland and the people." An IS affiliate claimed responsibility for the attack in an online statement, saying it killed everyone in the vehicle. It identified the officer and said the fighters seized light weapons from the policemen before they fled unharmed. It said the operation was to avenge women jailed in Egypt. The claim could not be independently verified, but the statement's language and the nature of the attack suggest it is authentic. Militants have been targeting security forces in the Sinai Peninsula for years, but their attacks have grown more deadly and frequent since the 2013 military overthrow of Islamist President Mohammed Morsi. Sinai is the base of a local affiliate of the extremist Islamic State group, which is now spearheading the insurgency. While most of the unrest has been centered in the northern part of Sinai, there have been attacks in the mainland as well, mainly small-scale bombings targeting police. The frequency of attacks in the mainland had declined in recent months.